So about a year ago (and the other day, again), some friends and I had taken what we believed to be LSD, although it was somehow altered, or made a special way, which not only changed its effect, but also allowed malevolent entities to create an energy channel into us and place implants or energy blocks pretty far inside us. The fact that they haven't gone away over the past year tells me that unless I do something about it they're probably going to stay. I can feel them in at least 3 or 4 chakras, not to mention in other places in the body as well: hands, feet, arms, etc. I read your advice on how to remove implants but I don't even know where to start with these. There's so many and although I can feel them I don't know what psychological alleyways most are connected to. I'd just like some guidance on how to get going with getting these things out of me. Thanks so much. Indeed, there are no quick fixes to this, nor walking the spiritual path. People open up way too quickly, and expand their consciousness which activates karma before they are ready. This creates a lot of internal destabilisation in their higher vehicles. Once they come down off the drug, their consciousness contracts, and they don't have access into the higher densities, so they can't process the energy. Entities have a field day! Literally because the person is bleeding energy which they're not even aware of. It is this which draws the entities and causes them to persist in their field. The way forwards must be through steady progression, steady evolution. Connecting with soul, allowing it to guide you forwards, then working with any density that comes up - essentially you regress yourself into the tightness of the pain, then integrate soul through it. Releasing the entities is not the issue - they are merely the symptom not the cause. In any case, if a healer did remove them, they would likely return again, unless the soul integrations have happened. So the key is to walk the spiritual path, in every moment, and work with the integrations. Shortly, in September, I'll be re-releasing 5GATEWAYS - which is packed full of tips and advice for walking the path in daily life. Thanks again for bringing this up - it's such a powerful warning on the wall, to all who might be tempted in these diversionary short cuts, which are not short cuts at all! I have a little something I'd like to share and and question for Open (or anyone else), to do with entities but not drugs. A few weeks ago I was invited to a meditation evening. The first thing we had to do was stand in a square while the 'facilitator' read and cleansed our energy. I was not 100% ok with this but I allowed it as I was interested in the whole approach. Later the guy approached me and told me that I had, what he called, curses in my energy (there was some problem with translation as he didn't speak much english, and I not enough german). I interpreted this as being like entities in my field. I told him that I knew that they were there and that i was working with myself in order to release them. He replied that it was impossible for a 'normal' person to get rid of them but that he could do it for a small fee. Then if you do his extensive spiritual program you can learn to get rid of them yourself. He explained that they came from others (either intentionally or not). Anyway, I didn't take him up on his offer (until I work enough on myself it will just be replaced in time) but I was intrigued about one thing. He said that I had one 'normal curse' and that there was also a much larger one on my whole family!! I just wondered if you had any insight into this Open. Can entities effect groups of people in a certain way? Also, if I work to release it from myself will it be released from the whole family or will it continue to work on them but not me? I share your discomfort in what you describe about the process. First off, any 'normal' person can remove an entity in the process of meditation. Although you do indeed have to be quite sensitive to know they are there. Some people will simply feel it as density or blockages in their field, felt as tightness (explained here). When people get to the stage of being able to process this tightness, then they will over time release entities and implants if they are there. Having an awareness of them, does indeed accelerate the process - you know what you are working with. The intervention works as a group consciousness, and it can shift from person to person. So I would say that if a group of people have very close connections - a family - then yes, it is possible for an entity to move between them from person to person - I have observed this in families. So releasing it from you, doesn't mean entities will be released from your whole family. But, it is possible to become trained to release them in others. It's one of the key things we do on the Openhand facilitator program. There are big shifts going on in the field right now, which I will write about soon. They're making it easier and easier to process out this energy. The whole situation is feeling very positive to me. In ref.to 'psychadelics' being used as a short cut..
To be even walking a spiritual path indicates some form of intent. Isnt intention the root of discorse here. What if psychadelics come from no intent at all? what if I like entities and embrace their work with appreciation. what if i loved all these things equally and have no intent to any. Thats me and these psychadelics are one of the greatest gifts iv experienced in this life. I feel blessed to have felt them and am horrified to consider a life without the experience they offer. With regards psychedelics, I think we've tended to take a strong view to counter-balance the somewhat 'trendy' approach of trying to somehow short-cut the path (which I know you are not). The evidence seems pretty strong for a lot of people, that psychedelics can be very destablising - that is when you delve past the practitioners surface level consciousness. It often means working for a long time, diligently to correct the imbalances and disharmony. But then maybe some people's path is this divergence? Only you can decide. I'm simply reporting the challenges people often face afterwards. As for entities, it's great that you can take such a non-judgmental view. Yes love is necessary to help them return to source. But I wonder if there might be a slight confusing of absolute with relative truth going on within? In absolute, of course everything is perfect, even the distortions the entities represent and manifest as. But I have also witnessed at first hand, the terrible tragedy of souls being purposefully led astray and locked into a spinning nightmare. When you witness genetic downgrading at first hand, that's not at all a pleasant sight! I imagine, knowing you as I do, that some of the patients you work with, are suffering directly as a result of this intervention. I've seen the insides of pyschiatric wards - not a pleasant sight! Yes at a macrocosmic level, everything is fine, it's all just consciousness unraveling and playing itself out. But for the big picture to matter at all, it has to matter at the microcosmic level too - in everyone's lives. Your life has meaning, your soul has purpose. What is that purpose? I put it to you that it is to self-realise, and to become a brilliant, streaming expression of the One. In order to achieve that, is to forge the soul beyond such intervention. This will take a good degree of surrender and acceptance yes, but also warrior will. And the discernment to say "this is me, this is my core, this is who I am". It is such a will that then ejects distortion - and entities - from within. And paradoxically, I have found, it is such a will which gives the raptor sense of purpose, motivation and commitment to evolve also. For them, acceptance seems to cause them to fester in the same, tired old mess. But, yes a more loving approach works better for the greys. I'm pleased you had the courage to offer the counter view. It's clear also, that your evolution is continuing wonderfully. Intent on the path, or impulse? "To be even walking a spiritual path indicates some form of intent. Isnt intention the root of discourse here." that to be walking the spiritual path, is to be free from all intent. And lack of intention is the driver for the unravelling. Openhandway for example, is a process to relinquish all such inner control and intent; the unraveling drives the path forwards. Does it take an intention to apply it? Yes! I happen to believe there's one authentic intent, which is to surrender to the flow. Intent then becomes the natural movement of the universe, the natural impulse that speaks through your soul. Which is why I tend to use the word 'impulse' rather than 'intent'. Openhandway follows the natural impulse. Thanks Open. That makes things much clearer! Thank you Open this is like a missing link for me sparking contemplation of the place I have experienced where, atj the point of expulsion, will somehow flips into feeling impotent, like intent, and then sensation of the density and will evaporate back to the cold light of day. Like iron will and steel in the soul! I think I've found a bit of Divine Masculine here! But with a suspect bit of feeling of 'nice solution because everyone's a winner rather than direct confrontation.... which goes further down the rabbit hole. I think that's where this impulse to comment comes from. I didnt want this forum to be a deterent to psychadelics as such. It should be no surprise why everyones experience is detrimental on so many levels. Its an unfortunate outcome but that's societys m.o. Im only suggesting thats not all there is. The psychadelics tied history, placement now and future role for humans should not be overlooked. Risky I agree but at times neccessary. I may swing a lil too much to the absolute. But I prefer not to. I do not condone such interventions but they certainly make it interesting. The deeper the feeling the more convoluted the detail the better the story. I feel such things but have no feeling towards them. So there is no good and bad but if there was wouldnt one want it to be as bad and good as possible? Well I guess that depends on whether you have an extreme nature or not! It's pretty clear you've misunderstood the main thrust of the Openhand Approach. We're actively encouraging people to explore the depths of their passions - particularly with regards to the physical realm. To us, attachment is where you - as the One - expressing as a soul, become limited because you allow yourself to be defined by these passions - to be 'owned' by them. To us, that's what attachment really means. 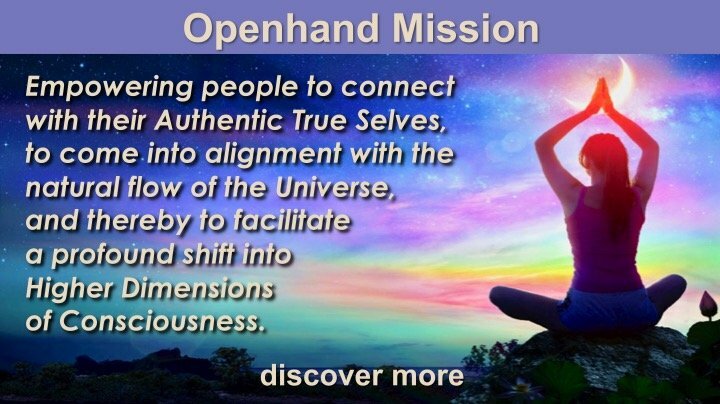 If you take more than just a cursory browse of the articles section, like for example, Living Your Dream, what does your soul ache for?, and Seven Rays of Divine Impulse then probably you'd get a bit more of an insight into what Openhand is really all about. Ah nice one open (re: extreme nature). Haha I do have an extreme nature dont I? Well in comparison to the vibe on this planet anyway. hey Yasha. Thanks for sharing. I think u may have miss read me too. I was sharing the message authentic experience is possible with psychadelics. They came after a long time of yes losing attachments and through what people call meditation.There was no'using them' moreso I discovered they were interwoven into the fabric of my being. What if u did give up the desire for the things u mention? Dont give up the thing, have or do whatever life offers but how bout this desire? Are you lacking in life or are you possibly a part of it. What do u say Yasha? Whats the answer to you?